Looking for a consistent mutual fund to start your investment? This fund, with a convincing performance over the past five years, can be a suitable option. Keeping aside the current market corrections, the trend shows that apart from the selected mid-sized companies, a large number of big companies are outperforming the mid-sized ones. Additionally, the steep valuation of the mid-cap stocks is limiting the scope of alpha generation across sectors. In such a case, the investors should consider multi-cap mutual funds which proffer benefits of both the worlds to create wealth in long-term. SBI Magnum Multi-Cap Fund is one such option that not only captures the growth of the large-cap stocks but maintains an appropriate balance between the valuation of the large and mid-sized companies. As per the data till the end of 2017, this fund has been one of the consistent performers in the multi-cap category and acquired top quartile ranks 4 times, since 2011. Under the efficient management of Mr. Anup Upadhyay, the fund is picking up the stocks having attractive earnings growth trajectory over at least 3-year horizon. The fund has tried to avoid short-term tactical calls and as a result, the time has proffered it good rolling returns over the past 5 years. Rolling returns are considered to be the most credible performance measure in the mutual fund space that provides an annualized overview of the returns calculated on a daily/weekly/monthly basis. 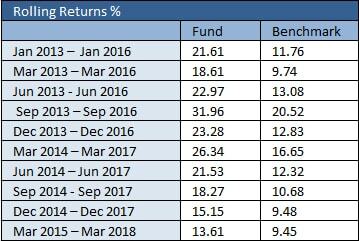 The rolling returns of SBI Magnum Multi-Cap Fund clearly indicate that the fund has consistently beaten its benchmark (S&P BSE 500) in 3-year rolling period over 5 years. From the above data, we can figure out that the fund has given more than 20% rolling returns, 60% of times, despite the prevailing volatility in the market over the considered period. 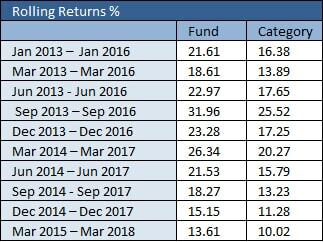 Similarly, the fund has outperformed its peers in the 3-year rolling period from 2013 to 2018. The Upside and Downside Market Capture Ratios are effective analytical measures to understand the performance of a fund during the rising and falling market conditions. Over the last 3 and 5 years, the upside market capture ratio has been more than 100% which indicates that the fund was able to generate higher returns than its benchmark when the market was rising. Similarly, the Downside Market Capture Ratio was less than 100% which specifies the fund had some risk protection when the market fell during 2015-16. We encourage our customers to start investing in the funds like SBI Magnum Multi cap Fund through SIP mode. Why? If you would have opted for a systematic investment plan (SIP) and invested Rs. 5000 every month in SBI Magnum Multi-Cap Fund for the last five years, it would have created a wonder. The value of your investment would have grown to approx. Rs. 4.8 lac (as on March 29, 2018) from Rs. 3 lac, by now. Also, if we perform further calculations, the fund stands among the top 10 diversified equity schemes with a monthly SIP return rate of 19% over the last five years. Being from the moderately risky multi-cap category, the fund has a high capture ratio (more than 1 is good) which assures substantial risk-adjusted returns. The fund seeks both value and growth by retaining a balance between the large and mid-cap stocks in its portfolio. It has consistently outperformed its category and benchmark over long time intervals. With approximately 21% of annualized trailing returns in 5 years, this fund can be a suitable option for the investors with moderately high-risk appetite and long term investment goals.